Phillip Jerrord Heath, aka, The Gift, was a basketball player at his high school. In the year 2002, he got attracted towards body building, but started his career as a body builder in 2005. At National Physique Committee (NPC), he won IFBB pro championship. This victory proved a stepping-stone in his career. Phil Heath a good basketball player and double majored in Business Administration, but instead of making career in these fields, he chose body building as his vocation which turned out to be the right decision. He won Mr. Olympia title for two consecutive years (2011 and 2012); along with several other accolades such as IFBB body building titles, NPC titles and many USA body building championships. Ever since Heath entered the body building field, he never looked back. He went ahead with a perfect workout routine and diet plan. 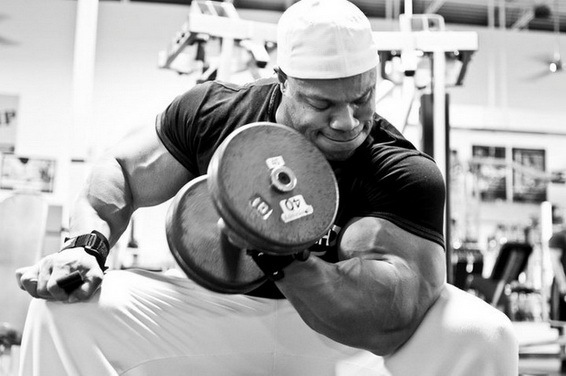 If you wish to know how Phil Heath made his muscular body and won titles with a workout plan, then here is his entire exercise regime. Phil does his body building workout for only four days in a week. He takes rest for two days – on Wednesday and Sunday. He does cardio workouts on Saturday that energize him and keep him healthy to follow a strict workout regime. He also does abs 4 times in a week. This segregation of workout routine helps him concentrate more on muscle building without putting too much strain on his entire body that would make him dull and tired. Phil always suggests his followers not to start with any new exercise, if you think the workout routine you are currently following works well for you. Even a small change in your workout plan may affect your results big time. Especially, when a contest is close, do not think about altering your workout plan. Doing more of cardio exercises can help you stay invigorated the whole day. He says smaller amendments in your routine like not counting the sets is also fine, as it will keep you energized for the second workout session. Heath has divided his meal into seven smaller segments and continues to enjoy eating all throughout the day. This keeps him brisk and active. The content and diet of his meal largely depend on whether he is preparing for a contest or is off-season and not preparing for any competition.